This section contains an archive of KFDU's best topics/posts submitted by it's members. I happened upon this post whilst looking for info on the Moken via Google.....I am in the UK not Aus...specifically I am in the Channel Islands,closer to France, surrounded by some of the worlds biggest tides, about every type of sea bed you can think of, and plenty of fish. There is always a leeward side of the island to launch off, and shelter somewhere in just about any weather. With fuel costs here spiralling, I sold my old diesel plodder that I used to fish and pot for lobsters, and have been pining for a way to get on the water ever since. 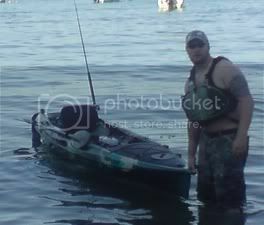 I started looking at kayaks, and having test paddled quite a few, the one that felt best to me (I am 6'3'' and like 260lbs) was the Moken. It seemed like it went further on a paddle stroke, even though it's wide it didn't feel like the gunwhales were in my way like the big game. It's a great boat for us bigger guys, but it doesn't feel huge and cumbersome, and the rudder worked great when I headed out into the wind a little, meaning I could really drive it with the paddle without feeling like I was wasting effort. After being a pest and takingh out my local suppliers demo model 3 times in different conditions, I have ordered one for myself. Some good ones on there too! After a bit of research, I've found that the Moken uses the same hull as FF have used since 2005 on their "Apollo" kayak, which is very highly regarded in Hawaii and used by hire fleets etc. The deck layout is different for the Moken but the hull is the same.... these have the full 13'1'' available as waterline, with the bow extending all the way forward, and it's thin leading edge is to cut down friction. Me and my buddy paddled my Mok and his prowler13 side by side, and the Moken is equally fast if not a bit quicker, even when we swapped yaks to see if it was paddler related. At my 260lbs it is also way drier than the P13. It tracks ok but the rudder makes it easier to point where you want it to. There is no real in hull storage, but that suits me fine, I like the idea of the covered front well as a place for a decent brace of mackerel, with a couple of cool chest ice packs in there and the hatch closed I'll keep my catch fresh. I won't be fitting a fishfinder, as almost everywhere I fish I can see the bottom anyway, and I only take one rod and a handline, plus maybe some longline. I'll do some scallop diving from it, if they give me a psrmit...we have a kind of Abalone here we call Ormers, that can only be fished without underwater gear, and only on certain tides , by law..... my Moken will get me to some reefs an islets that the motorboats won't get to. It's nice and stable for me, maybe not quite as solid feeling as my other buddies wilderness ride 135, but less tippy on the primary than the prowler13. I'm going for a full days fishing tomorrow, so far I've just been getting to know it, and I'll post up my findings. Anyone considering the Moken, I would say this...make sure there are a few to choose from....mine is very nicely moulded and the fittings are fine.....my friend liked mine, sold his P13, ordered a Moken, and it's nowhere near as nicley put together. There are pinholes, rough moulding on the scupper holes, and the rod holder screws are at all sorts of angles, like they have been put in a hole that doesn't line up with the fittings. His is going back, rightly so but mine is sweet and I'm very happy with it. I have done a couple of full day trips now in mine, and it really isn't slow for a 31" inch beam fishing SOT......I can catch P13's no problems, and I track fine without the rudder down, with it down is great when there's a fish on, for keeping the line on the bow hands free. I would say that if you're using the bow hatch, don't do up the bungy on the very front, as you won't be able to get to it easily on the water, especially with a fish flapping all over the footwell!! The seat could do with a better way of staying up, the bungy comes off the tag just from moving around in your seat. Also, the hole for the cabling comes through into the centre hatch between your legs....it can't get to the inside of the kayak, but it does get wet in the centre console tackle box if you don't plug that hole, so my tide table and marks book got an unexpected soaking.....I will plug it from now on. Mine stays dry inside, no ingress into hull even when I practiced flipping/righting/re-entry for an hour. It isn't bad to handle at all,I find it almost balances itself, the handles are in a great place for the fulcrum point....good design. Here's some pics of the old model and the uprated model....how's your Spanish? Hope you guys don't mind a foriegner popping up all over this thread, I just wanted to add some info on the Moken. Had mine for 4-5 weeks now, used it in some varying conditions,been out most every day for a few hours each time, and I love it. It's comfortable, stable, tracks well and isn't at all as slow as some folks on UK forums (who had never paddled one, it turned out) had led me to believe. I added a scotty rod holder and extender and a compass, lure rack and knife holder on the console, and I am currently working on a canvas fish chute that comes from the round hatch on the bow well back to the cockpit, so I don't have to open the hatch ties before I go to sea. So far it's fed me a few times and taken me into some reef systems and offshore sandbanks that I always wanted to go to in my boat, but couldn't navigate with my draught. The only one negative thing I found is the seat attachment, it worked loose and came undone, but I replaced the seat with a nice highback jobbie, and now it's comfy as.